In a large saucepan, combine sugar, milk, chocolate chips and 1/2 cup butter. Bring to a boil over medium heat; cook and stir for 8 minutes. Remove from the heat and cool completely. Meanwhile, melt the remaining butter; toss with cookie crumbs. Press into a greased 13-in. x 9-in. pan. Freeze for 15 minutes. 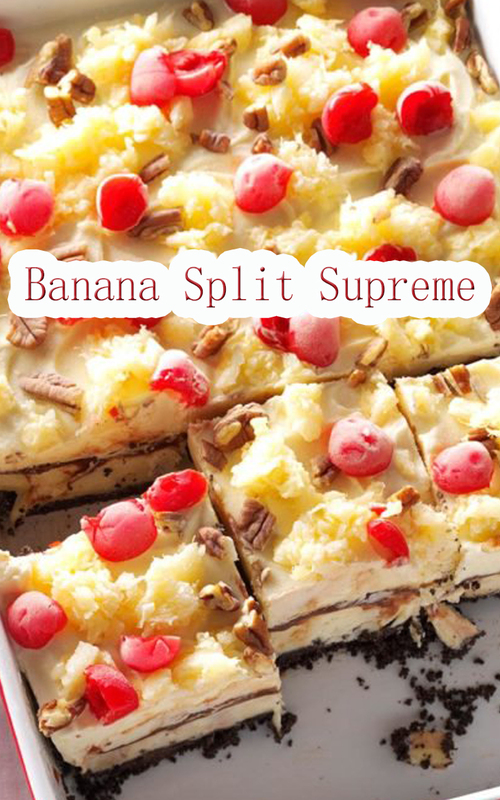 Arrange banana slices over crust; spread with 1 quart of ice cream. Top with 1 cup of chocolate sauce. Freeze for 1 hour. Refrigerate remaining chocolate sauce. Spread the remaining ice cream over dessert; top with pineapple, cherries and pecans. Cover and freeze overnight. Remove from the freezer 10 minutes before serving. Reheat the chocolate sauce. Cut dessert into squares; if desired, serve with whipped topping and chocolate sauce.